The founder of Burtle Silver Band, Allan Moxey, was born in Catcott Burtle in 1876 and spent most of his life farming. For a while, in about 1900, he worked as a signalman at West Pennard Station on the Somerset and Dorset Line. This was not a large mainline station and there were many quiet hours with little going on so, to pass the time away, Allan bought a cornet which he taught himself to play. Such was his enthusiasm that when he returned to Burtle in 1901 to marry Lucy Norris and help on his father’s farm, he persuaded a group of his and his wife’s friends and relations to take up brass instruments. Most of these players were, at that time, employed locally as farmers, peat diggers or railway workers. By 1905, with the help of the village schoolmaster, an able amateur musician, this group had developed into a band. The following July the band purchased a drum so that it could play at the house of Mr Hugh Carver at Chilton Polden to celebrate his success in the local elections. Allan Moxey continued to conduct the band for many years, the baton then being taken up by his sons Vivian and Norman and, subsequently, for over 50 years, by Norman’s son Jim, who retired in 2005, after celebrations to mark the band’s centenary. Burtle Silver Band’s reputation has become known over a wide area over the years, playing at events including Whit Walks, harvest homes, flower shows and fetes in villages in the surrounding area. The band continues to play and process at East Brent Harvest Home and also performs further afield at venues such as Weston-Super-Mare and Lyme Regis. In recent years, two major changes have taken place. One is that a member of the Moxey family is no longer at the helm. The other is the wide area, both in modes of employment and geographically, from which players are now drawn - ranging from Yeovil to Watchet, although Burtle is still represented, the grand-daughter and great-grand-daughter of the original drummer still playing in 2016. 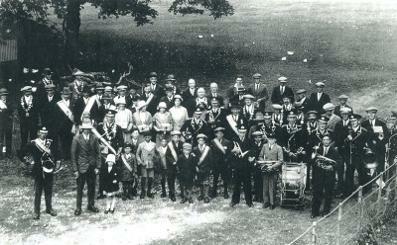 Burtle Silver Band has however, retained its original image as a friendly village band. Players of any age, background and ability are always welcome to join. Contesting does not feature in its calendar, the main intention to serve the community. Band practice takes place every Thursday evening, when repertoire is rehearsed in a purposeful but relaxed atmosphere.